Sometimes the garden tells you what to grow, rather than the other way round. I made a little spring corner in my front garden, next to a bench. The idea was to toddle down from the front door (the house is on a slope which falls across the front) to sit and appreciate flowers and scent for a few happy moments in early spring. I put in a hellebore, primulas, a sarcococca and a chimomanthus (wintersweet) tree. The sarcococca and chimomanthus will provide scent and the others more showy flowers. I also had 3 yuccas dug up, as they didn’t look very cottagey and were too near everything else. What good are yuccas anyway, I thought, as they only flower every few years? Off to the village plant sale with them..
2-3 years later, the yuccas have regrown. 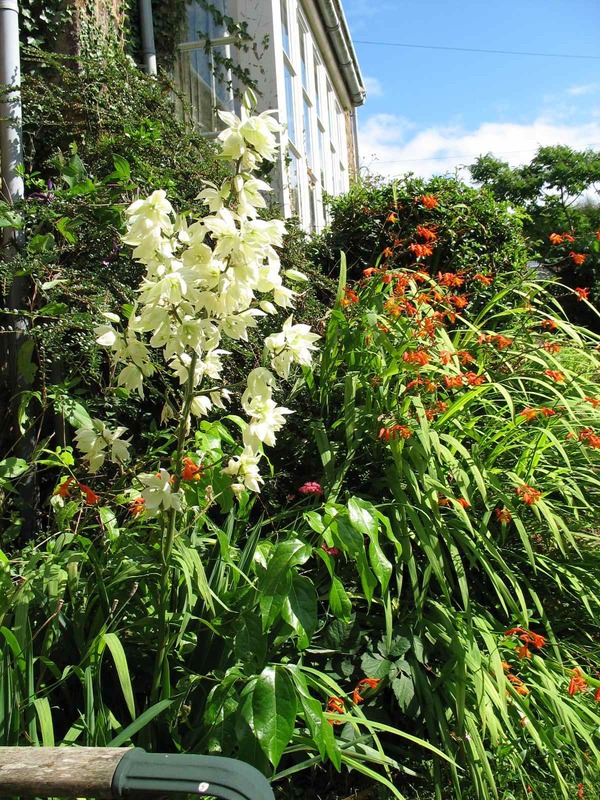 One is now in magnificent bloom, backed by orange crocosmia and shiny light green chimomanthus leaves. What to do now? I still want a spring experience, however am now converted to the benefits of yuccas. The sarcococca needs moving somewhere else less crowded, but the other plants can hold their own, I think. Beth Chatto has yuccas as focal points for beds in her dry gravel garden, so maybe I should look there for inspiration. The only thing is, I should move the yuccas a bit – they are too near the bench. Time to breed more yuccas?? Next post: Shoot – the website for gardeners, and their friends..